The brothers and sister mentioned in this old Berea College brochure happen to be my papaw's siblings...my great aunt and uncles. So many of my papaw's siblings attended Berea College around the 1930's and 1940's that the college created this brochure to tell their story. I was pretty young when I first saw a copy of the black and white pamphlet...pulled from an old trunk where my papaw had tucked it away for safe keeping. I loved seeing the story it told of my family! The "small three-room old-fashioned, weather-boarded log house" where my papaw and his siblings were raised. 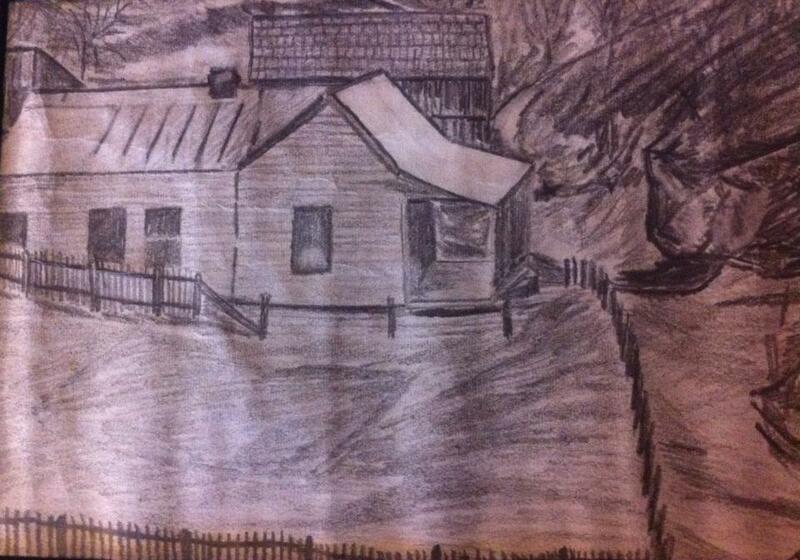 Aunt "Oh So Sweet" sketched this picture of the home many years ago. For so many years, Berea College has adopted a practice of serving, promoting, and preserving the region of Appalachia. They have done so by offering free tuition via work-study programs to countless Appalachians, being a voice of truth about the worth and value of those who reside in the mountain region, and keeping traditional Appalachian arts and crafts alive. My family connection to Berea College, and my knowledge of what the institution has done, and continues to do, for the Appalachian region made me want to travel to Berea, Kentucky myself. The community of Berea has blossomed around this institution of higher learning...and the town reflects much of the same attitude of care towards Appalachia that is found at the college itself. Earlier this summer, City Boy and I finally had the opportunity to travel to this special little town that lies right where the Bluegrass region of Kentucky meets the gorgeous beginnings of the Appalachian foothills. The campus of Berea College is absolutely beautiful! If you go, make sure you take the time to walk around...tucked within its boundaries are all sorts of fun surprises! The first wonderful surprise is the historic Boone Tavern Hotel. And, yes, it is named after none other than the famous Appalachian pioneer, Daniel Boone. Boone is one of my ancestors, so I was excited that City Boy and I were able to get reservations at the Boone Tavern for our stay. Goodness, they really know how to make you feel welcome there...and sitting on the tavern's front porch is to die for! Daniel Boone himself traveled right through this area on his way to the Bluegrass region. And across the street from the Boone Tavern Hotel, you can view a stone monument to Daniel Boone's trek through the area. Now no trip to the Berea College campus would be complete without a trip to the Loyal Jones Appalachian Center. The center runs a small gallery/museum filled with exhibits displaying the culture and history of the Appalachian region. Though small, the gallery was jam packed with so much information and fun trivia about Appalachia. We spent quite a bit of time here on our visit, just looking everything over. Do you see those Little Debbie's? I always loved those Oatmeal Creme Pies when I was a kid, such a sweet surprise to find out they originated in Appalachia! And let me just say, you know a place is good when they've got bark bottom chairs to sit on...just look at how gorgeous! Walking around on campus with City Boy, I ran into one of the best surprises of all. Have you ever read The Dollmaker by Harriette Simpson Arnow? The book is one of my all time favorites! It is an amazingly touching story about a mountain woman and her family who migrate from Appalachia to find work in the north. If you are a migrant or descended from migrants, this book will absolutely melt your heart. I was thrilled to turn a corner on campus and find that Arnow attended Berea College in the 1920's. This just made me love Berea all the more! You can purchase Arnow's book here. And just when I thought I had experienced everything great about Berea College, this happened...Berea Cornmeal Sugar Cookies! My word! A little trek to the Berea College Farm Store on the outer edge of campus lead us to this treasure. Now I love sugar cookies...but when you combine them with the downhome goodness of cornmeal, they become magically memorable! Don't let a trip to Berea happen without a visit to this place! Something else fun at the Berea College Farm Store was salt...harvested from right in Appalachia! Did you even know Appalachia had local salt? You can read all about JQ Dickinson Salt-Works here. What an amazing story! Now, heading off the Berea College campus, in town we found The Berea Welcome Center. What's special is that the center is housed in Berea's Historic L&N Depot. Welcome Center employees confirmed my guess that this depot was in all likelihood how my great aunt and uncles from Eastern Kentucky travelled into the town of Berea to begin their years at Berea College. What fun to stand outside of the depot, look out at the tracks, and imagine their arrivals so long ago! I can only guess at the excitement and thoughts occupying their minds. It was probably the first time any of them had ever been so far from home! Inside the L&N Depot were some some wonderful exhibits...including a weaving loom display. Berea College has worked so hard to preserve and pass along this traditional Appalachian craft...and you can purchase handwoven goods in many places throughout the town of Berea (many using patterns found generations ago throughout the region of Appalachia). Now, Berea is not just known for weaving. In fact, the town is known as Kentucky's Folk Arts and Crafts Capital. If shopping for arts and crafts interests you, Berea is the perfect place! The town is filled with many great craft shops. And a good place to start is the Kentucky Artisan Center at Berea. More than 650 Kentucky artisans have arts and craft items for sale at the center. You can also purchase a yummy southern style lunch at the center's cafe! I especially enjoyed finding the items handcrafted by artisans from Kentucky's Appalachian region! What a treat to see all the talent found in the mountains! If you are more the antiquing type...Berea has quite a bit to offer in that arena as well. 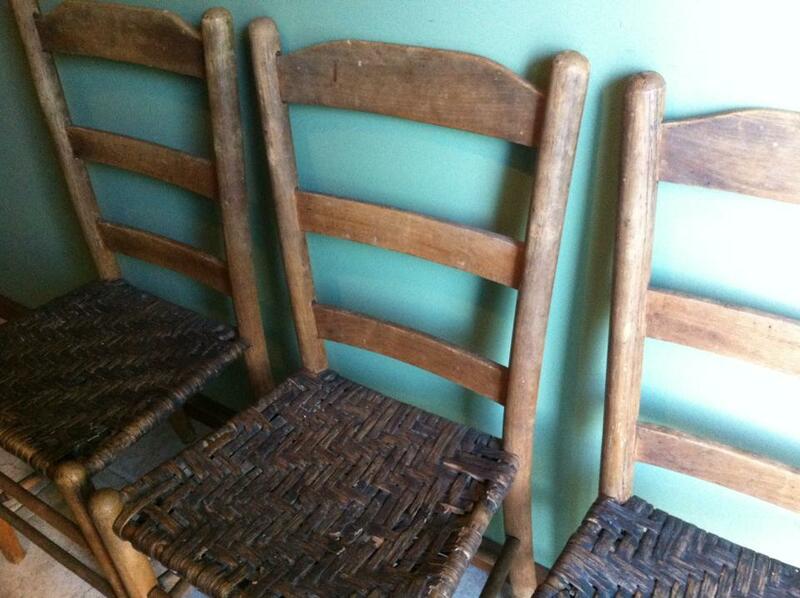 On our trip, I was on a mission to find more bark bottom chairs for our home. The chairs are difficult to find in the north...so I was hoping to have better luck in Berea. I'm happy to report that I was not at all disappointed! As a matter of fact, I found a treasure of an antique store....one of the best antique shops I have ever stepped into! Something Olde Antiques and Collectibles not only had a ton of bark bottom chairs, but was filled with so many other fun, old regional pieces. 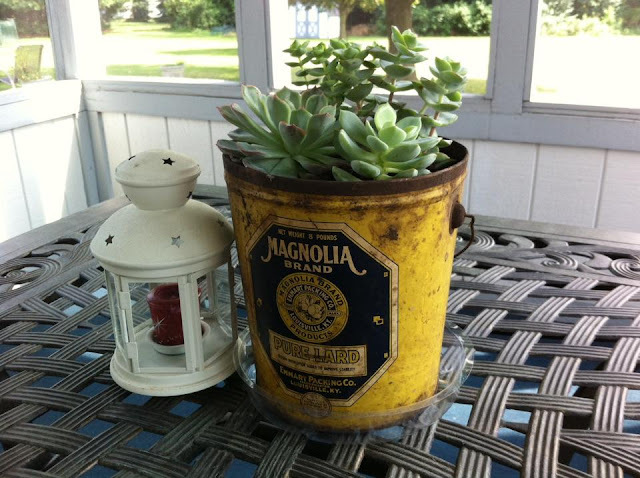 I walked away with three bark bottom chairs and an old lard bucket I'm now using as a planter. Best of all, the folks running the store were super friendly, and nice enough to explain to me the whole process of how bark bottom chairs were crafted. If you make it to Berea, you don't want to miss this gem! Another great local spot that is not to be missed is Berea's Old Town Amish Store. Don't be fooled by its name...while the store does sell Amish style goods, it also has so much to offer the visitor on the lookout for anything Appalachian. They even had one of the original front porch posts from country music legend, Loretta Lynn's old homeplace in Eastern Kentucky's Butcher Holler. What a totally unexpected surprise! And of course, this fun little store was selling Ale 8! If you're not familiar with it...it's a pop bottled in Winchester, Kentucky, and quite popular throughout Eastern Kentucky. I'm not a big pop fan, but an occasional Ale 8 is a real treat! I was also beyond thrilled to find that the Old Town Amish Store sold loaves of salt rising bread. This hard to find bread is made using an old Appalachian method, utilized well before store bought rising agents were readily available. We took a couple loaves home...and the bread was so delicious! It made wonderful toast, and I guess it didn't hurt that we smeared it with sweet dollops of black raspberry jam we purchased in Berea as well! And then, thanks to the Old Town Amish Store, we were able to sample yet another product straight out of the hills of Appalachia! Maybe I'm biased, but Climax Mountain Spring Water, from Climax, Kentucky, was the best bottled water I have ever tasted! Most bottled water has some sort of aftertaste, or subtle strange flavor. Climax Mountain Spring Water had no such thing! It was truly just crisp, clean, and refreshing. And, my word, I just adore what the label says! So sweet, and so true. LOVE it! Well, I've saved my absolute favorite part of Berea for the end of this post. On the final day of our trip, we took an early morning hike on the Indian Fort Mountain Trails just at the edge of town. The area is known locally as The Pinnacles. The Pinnacles is a series of several trail options, including summit views entitled, Indian Fort Lookout, Devil's Kitchen, and Buzzard's Roost. For our hike, we chose to climb what is called the East Pinnacle. What makes this hike so extra special is that at the summit, you can view the very start of the beautiful Appalachian region! If you love Appalachia, the moderate 1.3 mile hike up the East Pinnacle is so worth it. City Boy and I made it to the top shortly after the sun was up, but still low, over the rows upon rows of gorgeous mountains stretching for miles. It was absolutely breathtaking. You could truly see where the Bluegrass region gives way abruptly to the grandeur of rolling, tree-dressed peaks and summits, and the deep, cool comfort of hollers. It was a precious moment standing there...looking to the east, to the region of my roots, to the land that filtered every drop of my blood before it eventually trickled into the northern flatlands. As the sun rose higher and bathed each layer upon layer of mountains in bright rays of dawn, I thanked God for my heritage, the gift He gave me in my connection to such a beautiful region...a region so rich in history and culture, and a people who have continuously filled my heart with warm mountain memories. And I felt so incredibly thankful for the chance to visit a place that also seems to recognize the richness and value of the mountain region. If you ever get a chance...head to Berea yourself. I've no doubt it will inspire you to celebrate your own Appalachian heritage! Enjoyed your article on Berea. I had an uncle and a business partner (both physicians) who graduated from Berea. An interesting fact about Berea College is that there are very few, if any, legacies since almost all graduates succeed to the degree that their children are not eligible for admission. That is really interesting, John. Guess that's the sign of a really great college! My great uncle who mortgaged the heifer to start at Berea became a physician as well. He was a well-loved small town doctor for many years. I deleted my previous post because, as my Dad would have said, it was poorly written. I'll try again! My father, Forrester Ison, was from SE Kentucky - Oscaloosa - and his father worked in the coal mines. There were 12 children in the family. He enrolled at Berea because the family was so poor it was the only school he could go to and and a couple of his brothers went there as well. He loved his years at Berea and spoke of those years as the best. He was a school administrator for 40 years and always spoke highly of his time at Berea. Thank you for reminding me of what a wonderful place it is. It's on my bucket list as I never got to go there and share it with him. Thanks so much for sharing your father's story, Kathy! Yes, you should definitely try to make it to Berea...I absolutely loved the place! Your dad's family sounds similar to my papaw's. Papaw came from a family of 14 children. My papaw really wanted to go to Berea...but so many of his brothers had already left home to go that he knew his dad would not be able to handle the family farm on his own. So he stayed home to help, and never went to college himself. He remained an Eastern KY farmer the rest of his life...but he always valued education, having seen the good it did for his siblings. Thanks, Bob! You're blessed to live in such a great place! I am a Berea College grad and my daughter will be come May. I enjoyed your article but was a little disappointed that you didn't highlight the crafts that are made, marketed, and sold by the college students themselves. My daughter has worked her entire career at the Weaving Studio, Catalog and Marketing Office, and the Loghouse Craft Gallery. The experience she has gained in her work will only be rivaled by the knowledge she has gained from her studies. Kim, yes, the Berea College students do make amazing crafts to sell! I was able to see a few of these crafts on my trip, but we had a limited amount of time. Unfortunately, I was not able to make the Loghouse Craft Gallery, nor the Weaving Studio, etc. There were many other things about the trip I would have liked to include in the blog, but needed to end the blog somewhere, so had to edit a great deal. My great aunt mentioned in the article learned weaving during her time at Berea College...and continued even after her time there. Maybe someday I will get to go back to Berea, see more, and write a "sequel" to this blog. :) Blessings! Thanks for your comment on our Remembering the Reedys: Appalachian Music, Migration, and Memory documentary blog. I've enjoyed checking yours out as well and came across this post about my undergrad alma mater and home-sweet-home! My very first documentary was about the closing of the Berea College Appalachian Museum (https://www.youtube.com/watch?v=FpI6tTSCNAM), which had been the most significant memory of my first-ever visit to Berea on a 4th-grade field trip. As you discovered by visiting the BC Appalachian Center, the College never abandoned its Appalachian commitment as I feared it might when I made the documentary for a class project many moons ago. So many familiar sites in this post... thanks for sharing about your visit. If you're ever in the area again, please let us know.